Spring is almost here and the bunnies are back at Winans! We’ve been busy at the factory making marshmallow, bagging up novelty Easter candies and of course, making lots and lots of chocolate bunnies! 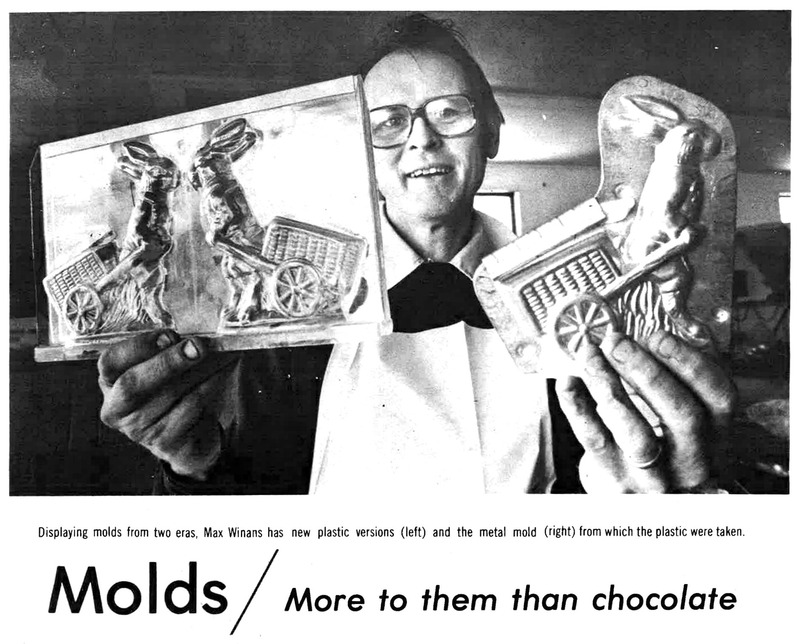 Winans has been making chocolate molds for over 50 years! Chocolatiers began using chocolate molds in the mid-1830s in France. These molds were made of sheet copper, stamped with geometric shapes to make solid chocolate candies in mass quantities. Prior to the advent of chocolate molds, chocolate was consumed in liquid form only. As the popularity of molded chocolate rose, small animals and other figures were also created in mold form. Max Winans, founder of Winans, used metal molds from Germany. Many of the metal molds that Winans owns were made by Anton Reiche. Some are just marked as being from West Germany. Anton Reiche is a famous mold manufacturer from Dresden, Germany. He founded his mold company in 1870. German mold manufacturers excelled at making chocolate molds in a variety of sizes with incredible detail and designs. 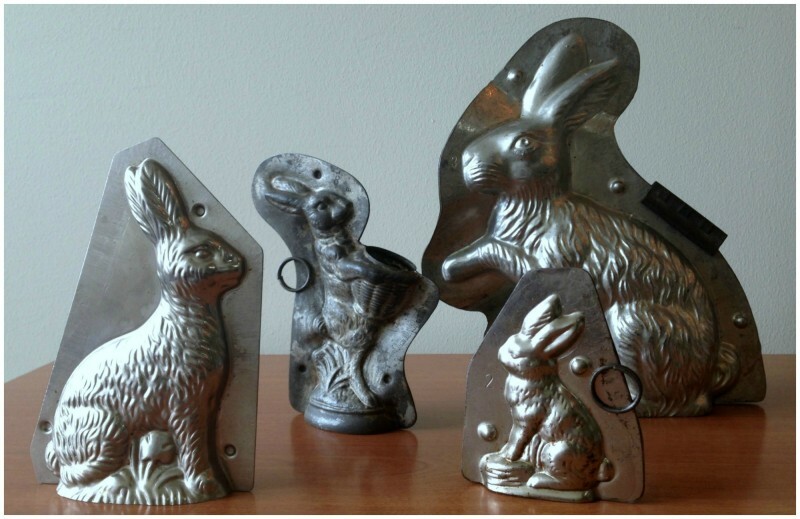 Molds of sitting rabbits or bunnies are the most common of the antique chocolate molds. We still make many of the molds that Max Winans first made at Winans in the 1960s, but we no longer use the original metal molds. Max took the metal molds and had them recast in plastic. This allows us to make more bunny molds at a time and results in a higher quality mold. 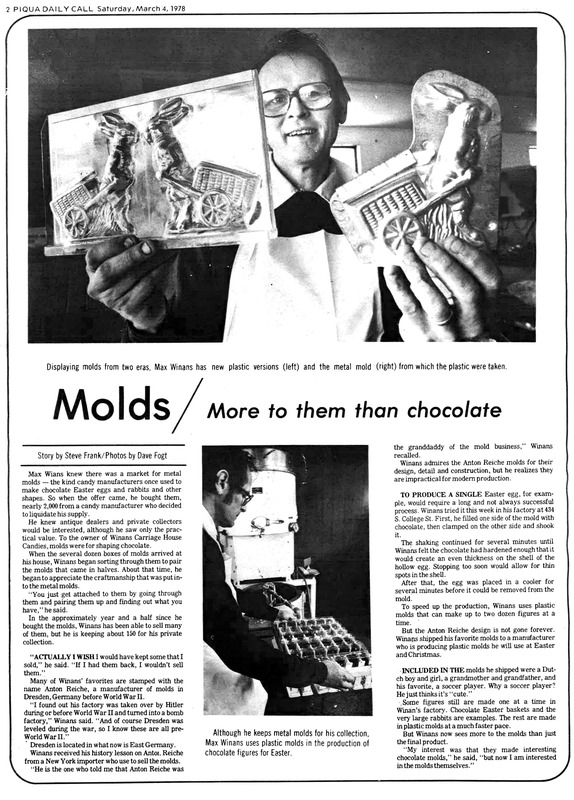 In March of 1978, the Piqua Daily Call published an article about the large collection of chocolate molds Max had acquired over the years. Check out the article, Molds / More to them than chocolate! Chocolate picks up any imperfections in the mold. Over time metal molds lose shine and are easily scratched, both the lack of shine and scratches would show up in the chocolate. With the plastic reproduction of our original molds we are able to carry on Max’s traditions while still creating beautifully molded chocolate! Our sitting and standing bunnies, as well as our bunnies with backpacks, walking sticks, carts, baskets (as well as Race Car Bunny!) are all cast from our original metal molds. The Floppy Ear Bunny and the Big Eye Bunny are much younger than our other bunnies. Since we no longer use most of our original metal molds, we have them on display in our Hometown Store in Piqua! If you look closely at the molds, you might notice their manufacturing mark (many of them were made in Germany by Anton Reiche) or see where Max soldered the clips onto the mold. Most molds are multiple pieces and have to be clamped together with clips. To keep track of his clips and make the molds easier to use, Max soldered the clips onto one of the pieces of the mold. Today our plastic molds are held together with magnets! 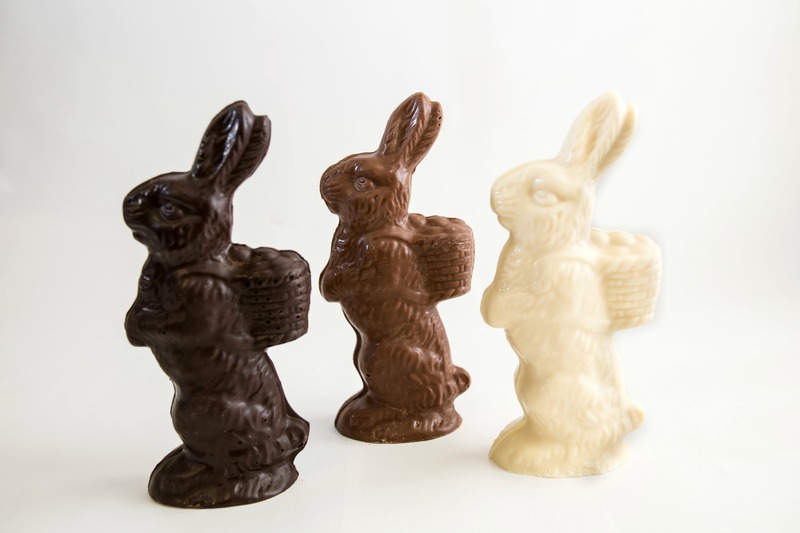 In order to make our molded bunnies today, warm, tempered chocolate is poured into each mold. Then the molds have to be shaken in order to remove bubbles and evenly distribute the chocolate. The chocolate molds sit in a cold, refrigerated room until the chocolate is solidified and can be removed from the molds. Sometimes excess chocolate has to be trimmed or shaved from the bunny before it can be packaged and sent to a store or a customer at home. 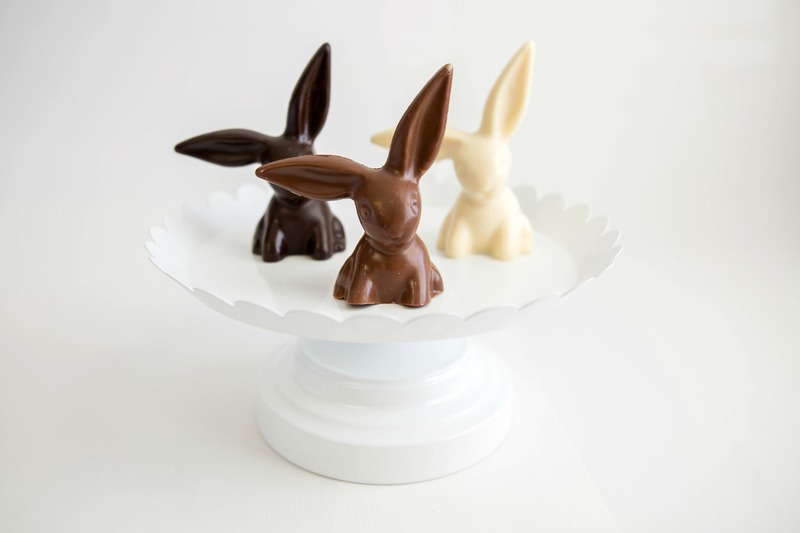 Our bunnies are available in milk, dark and white chocolate. A few of our bunnies are also made in peanut butter. Our biggest bunny is Big Max, named after Max Winans! He weighs in at 20 pounds and was first introduced in 2013. We hope that one of our many molded bunnies will be part of your family’s Easter tradition this year! I am wondering if Anton Reiche molds were always stamped with the Anton Reiche mark? I am trying to identify many chocolate molds that we have in our possession, but many do not have markings. All were used in the production of chocolate novelties from 1935 to 1950. If you have any tips on how to identify Anton Reich molds that have no markings or know of a source To help identify the molds we would greatly appreciate any help. We recommend reaching out to Anton Reiche Chocolate Moulds on Facebook, it is a fan page and has more information than we can provide from our knowledge base. It’s not a page for fans of the chocolate molds by the prestigious German manufacturer where you can share photos, exchange tips, and info. It is not an official page.